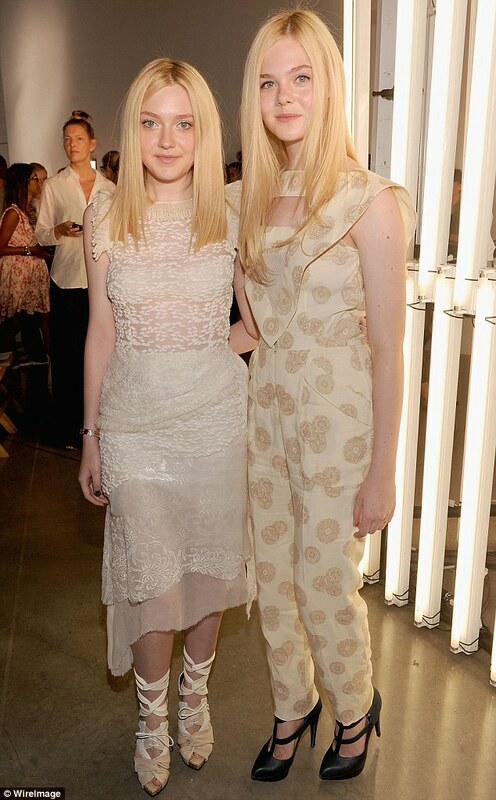 There is four years between them but Elle Fanning already towers over her elder sister Dakota. She may have only just hit her teens, but the 13-year-old already has the endless legs of a supermodel, as displayed at New York Fashion Week yesterday. The young actress is about 5 feet, 7 inches while her sister is just five feet, 3 inches. The talented siblings watched the Rodarte Spring 2012 collection by Californian sisters Kate and Laura Mulleavy. They both opted for cream-colored, flirty attire from the brand with minimal make-up. Elle opted for a cute, patterned jumpsuit with a triangle bib-style design at the front. She wore black buckled heels. Dakota wore a cream laced dress with an asymmetrical hem and lace-up wedges. The blonde beauties joined a star-studded audience including Taylor Swift, Beyonce and Solange Knowles, Rooney Mara and Anna Wintour. The sat next to Franca Sozzani, editor of Italian Vogue. Elle has been the belle of the Fashion Week ball, attending a number of shows in a variety of outfits. On Monday she donned a red top and shorts combination which she paired with strappy, gold-soled wedges for the Marc Jacobs' collection. The star was particularly interested in the show as she's the face of Marc by Marc Jacobs Falll 2011 campaign. Earlier On Monday, Elle was snapped arriving for the Ohne Titel show, donning more casual attire. She wore a blue shirt buttoned to the neck and tucked into beige trousers with brown boots. Elle is becoming a Hollywood big shot in her own right, after starring in J.J. Abram's sci-fi blockbuster Super 8 this summer. It tells the story of a group of children who are filming their own Super 8 movie when a train derails, releasing a dangerous presence into their town. But she started acting as a baby, making her debut in Dakota's flick, I Am Sam, in which she played the younger version of her sister's character, Lucy. She then won her first starring role independent of Dakota at the age of four in Daddy Day Care. She then appears alongside Val Kilmer in Twixt and will then fly to Italy to film biopic, Vivaldi. She will star alongside Neve Campbell, Tom Wilkinson and Max Irons in the film, about the composer's life.